REUTERS On Saturday, China launched its Long March 7 rocket from its new Wenchang This launch marks a moment when China firmly staked its position as one of the world s great space-faring nations, Ars Technica reports. 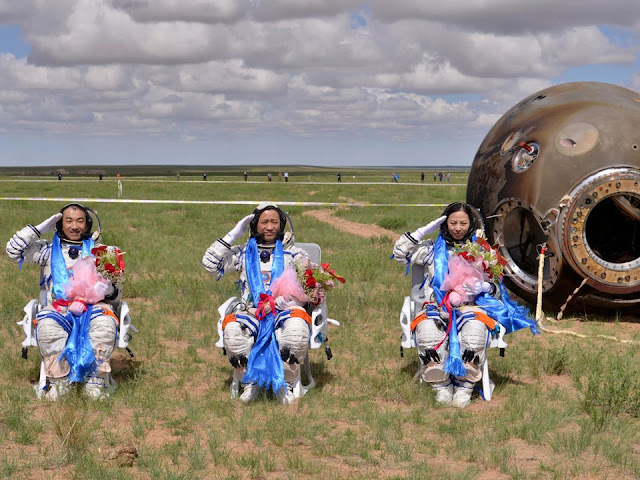 The launch of Long March 7 shows them stepping into the modern era if you will, Leroy Chiao, a former NASA astronaut and commander of the International Space Station, told Ars Technica. On Saturday, China launched its Long March 7 rocket from its new Wenchang Satellite Launch Center. This launch marks "a moment when China firmly staked its position as one of the world's great space-faring nations," Ars Technica reports. "The launch of Long March 7 shows them stepping into the modern era if you will," Leroy Chiao, a former NASA astronaut and commander of the International Space Station, told Ars Technica. "The message is the same that it's been for some time. They're in this game to stay. They're making long-term plans to stay in space and expand their presence in space." The launch showcased some of China's most recent advances in its rocket program. It was the first rocket launched from the Wenchang Satellite Center, which is in a position to allow better access to geostationary orbit for satellites. The rocket was also fueled with kerosene and liquid oxygen fuels, which are more environmentally friendly than the hypergolic fuels used by China up to this point. The Long March 7 rocket is part of a fleet of vehicles that will allow China to build and service a new space station, which may be completed at early as 2022, Ars Technica reports. Although this rocket isn't an immediate threat to the US space program, it symbolizes a huge step in China's long term plan to land its taikonauts on the moon by the 2030s, and eventually colonize it. Since China has been shut out of the international consortium that operates the International Space Station (ISS), the country has had to essentially clear its own path in its effort to explore space. And it wants to invite other nations to join in and take advantage of its advances. According to Ars Technica, the China Manned Space Agency recently signed an accord with the United Nations Office for Outer Space Affairs to allow other nations to conduct experiments on its space station. They will also provide flight opportunities for astronauts from those countries. "Space exploration is the common dream and wish of humankind. We believe that the implementation of the agreements will definitely promote international cooperation on space exploration and create opportunities for United Nations Member States, particularly developing countries, to take part in, and benefit from, the utilization of China's space station," said CMSA Deputy Director General Wu Ping in a press release. The US plans to keep the ISS in operation through 2024, with the possibility of keeping it running through 2029. But in the late 2020s, NASA intends to transition from low-Earth orbit to a deep-space exploration program with the eventual goal of putting humans on Mars by the 2030s. But, according to Ars Technica, there are major doubts about whether NASA will be able to follow through on these plans due to its current funding and review process, which is the reason NASA has had such a tough time moving forward since the Apollo program ended. The fear, Chiao said, is that after toying around with its Journey to Mars for a few years, the program will fizzle out due to the expense or delays with the spacecraft and rocket. In this scenario, "China will offer a favorable alternative to NASA's current partners, who have already told US space officials they prefer missions to the lunar surface before going on to Mars," Ars Technica reports. "For NASA and the United States, I'm afraid that we've been resting on our laurels for so long that we're going to lose our leadership in human spaceflight," Chiao said.